Having previously reviewed the Lakeland Beard Care Summer Night beard balm, I knew I wouldn’t be disappointed with their Morning Dew balm. Lakeland Beard Care only have two scented and one unscented balms and oils in their range at the moment but they haven’t taken any shortcuts and the products are all assessed and approved and the labels conform to the regulations. The Morning Dew scent is made up from a blend of Scots Pine, Cedarwood & Clary Sage essential oils. Woodsy scents are not my favourite but this has been blended so well and has a Piney, Woodsy, Earthy, slightly and sweet & floral scent and I quite like it. The scent is at a nice level, it isn’t too in your face and is blended so that you can catch all of the different scents without one scent being too dominant. This is in a base of Beeswax, Cocoa Butter, Sweet Almond Oil, Argan Oil & Jojoba Oil. The result is a creamy coloured balm with a medium consistency and it has left my beard feeling and looking good and of course not forgetting that it will also be taking care of the skin under the beard. 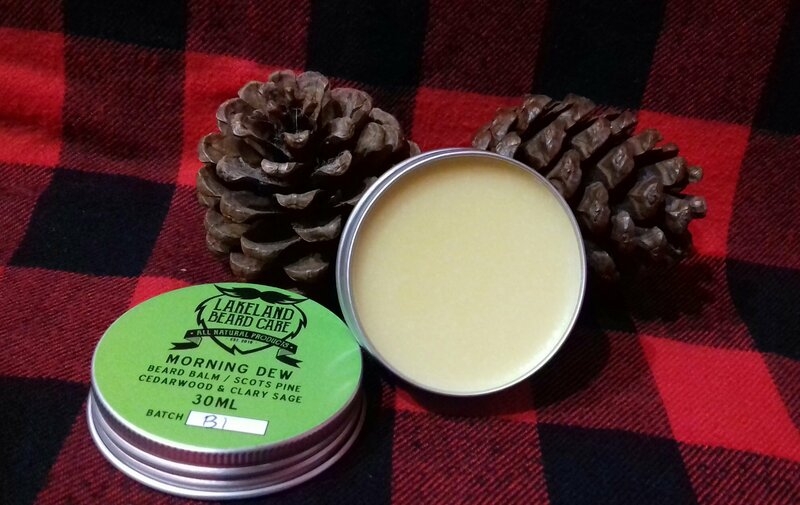 The Lakeland Beard Care Morning Dew beard balm comes in a 30ml screw top tin and costs £9.99 from their Etsy Shop.